For the last six decades, the marine industry has been turning out increasing numbers of reinforced plastic recreational and working craft, the vast majority being fibreglass (glass fibre reinforced polyester). A satellite view of almost any waterway in developed countries reveals a profusion of small craft (typically up to 20 m length) filling much of the available water space. Because composite vessels are highly durable, end-of-life (EOL) disposal has not so far been a major issue. Because composite vessels are highly durable, end-of-life (EOL) disposal has not so far been a major issue. Many of the numerous glassfibre boats produced in the early years still exist. But the time will come – is coming – when these craft reach the end of their lives and will have to be disposed of. The present trickle of EOL disposals is likely to become a ‘tsunami’ as successive generations of craft reach the end. Unlike metal and wooden boats, which are made of recyclable or naturally degrading materials, fibreglass craft leave an enduring trace on the environment. Present disposal methods are crude and generally involve chopping up composite structures and reducing them to fragments that can be sent to landfill. This approach is considered unsustainable in the long run; already certain countries, such as Germany and the Netherlands, have regulations restricting the disposal of GRP to landfill. Recycling will become the only realistic option. Reducing chopped fragments still further to sizes ranging from smaller fragments to fine particles can produce recyclate that is usable in construction materials such as cement, in bulk and sheet moulding compounds (SMC/BMC) and even in laminates for new boats or other products. 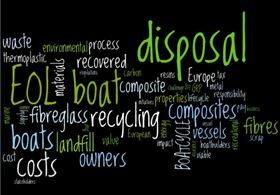 A boat recycling sector that already exists in embryonic form (e.g. the firm Boat Breakers in the UK) works on this basis. But the activity is relatively small-scale and un-coordinated at present and development of the integrated supply chain that will become necessary will take time. Also, more sophisticated recycling methods must evolve that can retrieve high-performance fibres, including carbon, for re-use and utilise separated resin more productively than simply as a fuel to burn – though even the latter is not without value. A number of initiatives have addressed the issue, given impetus by the growing tally of vessels that are abandoned on foreshores, in marinas, in fields and at sea (sunk) by their final owners who, faced with major costs and lack of disposal infrastructure, feel there is little alternative. Invariably, all signs that could help identify those owners - builders’ numbers, registration details and the like – are removed before abandonment, so harbour and local authorities are having to pick up the tab. Recently the European Union sponsored a project that addressed the end of life issue as part of an aim to reduce the environmental impact of the marine industry. The BOATCYCLE programme, implemented in Spain and Italy between 2010 and 2012 and so called because it attempted a ‘cradle-to-grave’ lifecycle analysis of vessels’ economic and environmental impacts, investigated disposal options for four types of vessel, a small yacht, a sizeable sailboat, a rigid inflatable boat (RIB) and a fully inflatable craft. One aim was to establish the total costs of disposal, including transport, using well tried methods that are familiar to scrapyards worldwide. For logistical reasons, the sailboat was scrapped at a facility located in a Catalan (Spanish) port. The other craft were able to be transported by truck to a central facility. In the case of the most complex disposal/recycling challenge, the sailboat, the first step was to decontaminate the craft by removing waste oils and fuels, bilge water, batteries and other environmental pollutants. Next, external metal items – spars, fittings, stanchions etc. – were removed. Once stripped down to the bare hull and deck, the craft was reduced with hammers, saws and a hydraulic grapple, to large fragments. At this stage wiring, foams, engines etc became separated and were removed. Different wastes were placed into containers for weighing and separate treatment. Fibreglass content, the highest proportion of the waste by weight, was sent as small fragments to landfill – the prevailing practice today. However, this practice has potential health and safety implications, uses scarce landfill capacity and incurs landfill taxes, which are steadily rising. Hence alternatives are needed. BOATCYCLE investigated and piloted a number of recycling pathways for the variety of craft in question. A key approach was to mix recovered fibreglass with certain thermoplastic matrices to produce new composites that can be used industrially. A similar pathway was piloted for neoprene, the basic material constituent of inflatable craft and RIBs. In the case of fibreglass, which will comprise the majority of waste for many years to come, ground fibreglass particles were first subjected to a carbonisation process to remove all resins, paints and other elements from the fibres. The cleaned fibres, graded into sizes, were then introduced into four different polymer matrices –polypropylene (PP), polyethylene (PE), polyamide (PA) and polyethylene teraphthalate (PET) – by comingling them in a melt extrusion process. The resulting composites were evaluated for their mechanical, thermal and other properties. Costs, energy usage and environmental impacts were assessed. Experiments showed that introducing glass fibres in loadings of up to 40% made PP and PE resins mechanically stronger and more impact resistant. This was less the case with PA and PET where the composites proved prone to hydrolysis in the presence of water. Energy consumed in producing the new thermoplastic composites was less than is used to obtain ‘virgin’ glass fibre reinforced plastic (GRP) composite. Where fibreglass loadings enhance matrix properties, as with PP and PE, the resulting composites can be used in a variety of new products ranging from street furniture to decking and other harbour infrastructure, and even to parts of new boats; also in automotive applications, helping to meet future European Community edicts mandating growing proportions of recycled plastic in tomorrow’s increasingly composite vehicles. The project succeeded in demonstrating that fibreglass can be recovered as part of the EOL boat disposal process, that the fibres are readily cleaned and extraneous materials removed, that a useful proportion of the fibres’ original as-new properties are available in the recovered form, and that the fibres can have a second service life. Moreover, the resulting thermoplastic composites are, unlike thermosets, themselves recyclable since they can repeatedly be re-moulded under heat. Neoprene recovered from inflatable and part-inflatable (RIB) craft can, likewise, be re-used. Here, the route was to clean the recovered neoprene, grind it to a fine powder, sieve and mix the result with thermoplastic polymers in loadings of between 10-40%, together with an added agent to promote dispersion. Again, this resulted in composites having impact tolerance and other properties significantly better than those of the unreinforced resins. The overall process was described in the post-project report as clean and fast, with only a small consumption of energy and water. BOATCYCLE’s ambitious mission to investigate impacts over the entire boat lifecycle was illuminating, particularly in showing that EOL disposal overall needs to be better managed and that there are better options available than those pertaining at present. The big questions that arise, however, are what costs are involved and who will pay them? Researchers calculated that the average cost of conventionally dismantling a 7 m long boat, including logistics, is €800, rising to some €1500 for a 10-12 m craft and €15,000 for a 15 m vessel. Researchers calculated that the average cost of conventionally dismantling a 7 m long boat, including logistics, is €800, rising to some €1500 for a 10-12 m craft and €15,000 for a 15 m vessel. (The escalation is related more to boat volume than to length, and to the greater complexity of larger vessels). There is a case to be made that the costs should fall on the boat owner, but many of the owners who are in place at the ends of boats’ lives are unwilling or unable to afford such substantial sums, at least within a short time span. 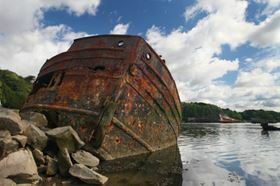 Unlike owners of metal boats, which have significant scrap value in their recyclable metals, those of reinforced plastic craft cannot rely on embodied scrap value to reduce disposal costs. Collecting the costs from owners, even those that can be traced, would be difficult. Another objection to this approach is that it would require every boat to be registered so that ownership can be traced throughout its lifetime. This imposes the need for an additional bureaucracy which, itself, would have to be staffed, managed and funded. However, registration also allows the possibility of imposing on owners an annual boat tax, akin to car tax, the resulting fund being earmarked for EOL disposal. This levy would be less onerous for owners over the duration of ownership than an EOL lump sum payment. 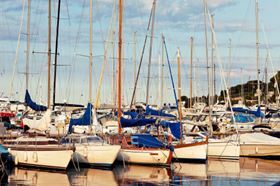 Alternatively, the cost could be shared between owners and the boatbuilding trade, the two principal stakeholders in boating, by using a combination of purchase levy with an annual ‘boat tax‘. A trustworthy body would have to be nominated to hold and administer the EOL fund. A further potential EOL alternative would enlist the insurance industry. Each owner could take out a ‘recycling insurance’, compulsorily or otherwise, under which the big disposal sums would be paid by the insurers in return for regular premiums. In taking on much of the ownership of the issue, the insurers would ensure that craft are processed in approved treatment centres that have the necessary permits while complying with the EU’s Waste Framework Directive and other relevant regulations. Where, as previously mentioned, boats are simply abandoned, the costs of removal and disposal currently fall on harbour or local authorities. In this case, it is the local taxpayers who pay, the disposal being treated in the same way as general waste disposal. The global marine composites market earned revenue of more than US$940 million in 2012 and this is expected to reach approximately $1.5 billion in 2018, according to a new report from Frost & Sullivan. For more information see: Adoption of marine composites – a global perspective. A consensus seems to be growing among European policy makers that extended producer responsibility (EPR) is the best route to take. In this approach, the industry itself has the primary responsibility for EOL disposal. Owners of time-expired craft would pass them back to their original builders, who would then dispose of them under controlled conditions using approved methods. This reflects the fact that boatbuilders and their suppliers are, after all, key stakeholders in the lifecycle process and working towards sustainable production is in their interests. Inevitably the cost would eventually be passed on to customers via new boat prices and this would, no doubt, have a deleterious effect on trade for a while. However, buyers would probably come in time to accept these costs just as they now accept VAT and other taxes. Another vexed issue that arises is who ‘inherits’ the responsibility if the original fabricator goes out of business? This is very likely to happen since many boatbuilders last nowhere near as long as the composite boats they build. Nevertheless, as is mentioned in the BOATCYCLE report, the EPR principle is indeed being considered in Europe and elsewhere, and the marine industry is faced with the prospect of either developing viable EOL strategies itself or having solutions imposed upon it by state or regional legislation. The industry could usefully start by building on the various initiatives that exist at present, with the aim of developing a rational and integrated supply chain. Specialist disposal centres, akin to those that have evolved for the auto trade, would be the most tangible manifestation of this chain, while disposal partnerships would provide coordinated treatment of the various waste streams. Markets would have to be cultivated for recyclates and the latter would need to be available in the quantities required. Therefore some coordination of supply chain development is needed. BOATCYCLE has been an important and far reaching initiative, but it has had notable antecedents. The Norwegian Marine Federation was publicly raising the EOL issue as early as 1988 and the country’s national authorities followed with a study in 1993. One conclusion was that for viable recovery of materials or energy from FRP laminates, scale is important. Success, it was argued, requires large-scale collection and processing of FRP scrap from a range of sources including agriculture and land transport as well as boating. A French study completed in 2006 under the title ‘The ELB Network in France’ concluded that decommissioning EOL boats would cost between €530 for a 4 m long craft and €4,750 for one 12 m long. It, too, raised the spectre of EPR. At about the same time, in Finland, a report on the Finnish Boat Recycling Project (Finnboat) put EOL costs at €150 per tonne of boat weight, plus transport services/logistics at some €70 per hour. During the study, carried out in conjunction with waste management company Kuusakoski Oy, 150 boats were collected and subjected to an experimental recycling campaign in which the final structural residues were crushed in Kuusakoski’s recycling plant in Heinola. Research has taken place outside Europe as well. For example, studies sponsored by the Japan Marine Industry Association with government agencies since 2000 have envisaged a recycling system in which the cement industry would absorb substantial volumes of suitable recyclate. There have been similar studies in south Korea. In the United States, where there are about three times as many small craft as in Europe, there has been less urgency to date since pressures on landfill space are not so great. Even so, the Environmental Protection Agency and others have been considering the issue. There has also been considerable research into the recycling and recovery of higher-performance and therefore higher value materials, principally carbon fibre, from which a growing number of high-end superyachts and workboats are being constructed. A pioneer in this area is Professor Steve Pickering who, with colleagues at the University of Nottingham in the UK, has developed recycling methods based variously on fluid bed thermal and solvent processing routes. These relatively high-tech processes may prove to be economically viable if stable and remunerative markets can be developed for the recovered carbon. We have outlined the work of Pickering and others in previous issues of Reinforced Plastics. Although EOL concerns have not yet instilled in most boatbuilders and their suppliers a high sense of urgency, they surely will. Legislators and landfill costs will see to that. Given the estimated 6 million recreational craft in Europe alone, and with boat lifespans of 30-45 years, some 140,000 of these vessels per year can be expected to become due for scrapping. Most will be composite and the majority of those will be GRP. This article was published in the September/October 2013 issue of Reinforced Plastics magazine. The digital edition of Reinforced Plastics is distributed free of charge to readers who meet our qualifying criteria. You can apply to receive your free copy by completing the registration form.